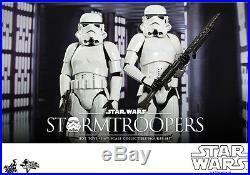 HOT TOYS STAR WARS: EPISODE IV A NEW HOPE STORMTROOPERS. 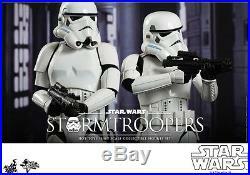 STAR WARS: EPISODE IV A NEW HOPE STORMTROOPERS. After the official reveal of Hot Toys' first wave of high-end Star Wars collectible figures featuring the infamous smuggler Han Solo and his best friend Chewbacca which were well-received by fans, we are moving the spotlight to the Galactic Empire for this new wave! Today Hot Toys is thrilled to present the 1/6th scale collectible figures set of fans' favorite faceless enforcer of the Galactic Empire - Stormtrooper! 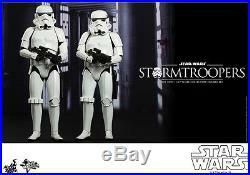 The highly-accurate collectible figures are specially crafted based on the image of Stormtrooper in Star Wars: Episode IV A New Hope featuring bodies with two different heights just like how these non-clone soldiers appear in the film, meticulously crafted Stormtrooper armor and helmet, detailed weapons, and a specially designed figure stand. 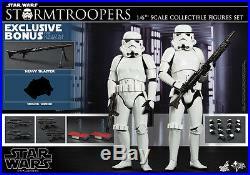 This collectible set will exclusively include an additional heavy blaster and a mouse droid as bonus accessories. 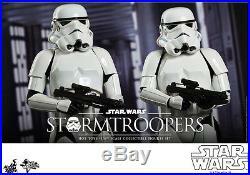 Star Wars fanatics don't pass up on the opportunity to add these troops to your imperial army! Height / Approximately 30cm / 28cm tall. Points of Articulations / 30. Special Features / Bodies with two different heights just like how these non-clone soldiers appear in the film, meticulously crafted Stormtrooper armor and helmet, detailed weapons, and a specially designed figure stand. Artists / Head Sculpted by N/A. Figure Painted by Lok Ho Head Art Directed by N/A. Figure Art Directed by JC. 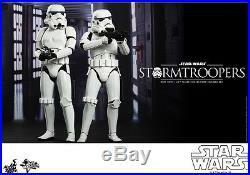 Each 1/6th scale Stormtroopers Collectible Figure specially features: - Authentic and detailed likeness of Stormtroopers in Star Wars: Episode IV A New Hope - Bodies with over 30 points of articulations - Approximately 30 cm tall / 28 cm tall - Each Stormtrooper includes the following: - Seven (7) pieces of interchangeable gloved palms including: - One (1) pair of fists - One (1) pair of relaxed palms - One (1) pair of palms for holding weapons - One (1) gesturing left palm - Each piece of head sculpt is specially hand-painted Costume: - One (1) Stormtrooper armor - One (1) black under-suit - One (1) Stormtrooper belt with leather holster - One (1) pair of white boots Weapons: - One (1) blaster rifle - One (1) blaster pistol Accessory: - Specially designed figure stand with Stormtrooper nameplate and movie logo The following additional accessories will be included for the Collectible Figures Set - One (1) heavy blaster - One (1) Mouse Droid Figures - Prototype shown, final product may be slightly different Mouse Droid - Prototype shown is not final, pending licensor approval Product details could be subjected to change without further notice. All products are original 100% authentic and never been used unless otherwise stated Packages may be opened to inspect the contents inside. Terms are subject to change in a reasonable fashion without prior notice. International Buyers - Please Note. But it may delay due to Custom / Weather. All our product have been checked and packaged in good condition before sending out. Customer's satisfaction is our goal. If, for any reason, you are not fully satisfied with the products and/or no receiving from us, please let us know and we will take every step possible to ensure your total satisfaction. For replace item, please return the item with its original package to us. We try to respond to messages within 48 hours, please bear with us as we are getting a lot of messages everyday. 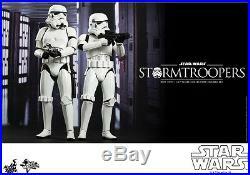 The item "HOT TOYS 1/6 STAR WARS EPISODE IV A NEW HOPE MMS268 STORMTROOPER SET FIGURE" is in sale since Wednesday, April 15, 2015. This item is in the category "Toys & Hobbies\Action Figures\TV, Movie & Video Games". The seller is "superbbtoysus" and is located in Taiwan. This item can be shipped worldwide.